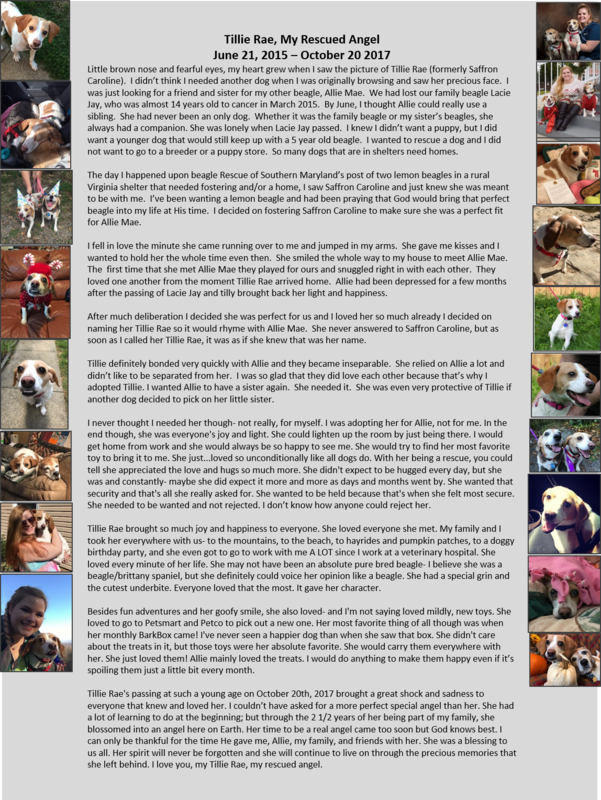 This wildly enthusiastic beagle mix puppy was rescued from a rural VA shelter who planned on euthanizing everyone on site because the facility was going to be painted. Saffron was delighted to be out of her crate at the vet's office and the subject of our full attention for the photo shoot. We all wanted nothing more than to take her home and let her run. She's friendly, happy, full of puppy kisses, and would probably love to have a kid or two to call her own. She gets on well with the other dogs and is just a sweetheart of a puppy. Success Story: Tillie Rae is settling in very well with our family. She loves everyone she meets and absolutely loves her sister, Allie Mae. Allie Mae loves her new little sister and Tillie does everything she does. She has a favorite toy already, which is a green elephant, that she tries to take every where she goes. She is such a happy go lucky dog that brings such happiness to everyone. We look forward to many wonderful years with our Tillie Rae.